Wrap up your summer break by exploring Israel on an enriching adventure! Get the most out of your 10 days by traveling with Israelis your own age & other students from University of Chicago for your entire experience. This classic trip leads you to discover the land, history, & culture through incredible hikes, unbelievable scenes & sites, enchanting cities, amazing Mediterranean cuisine, & much more. 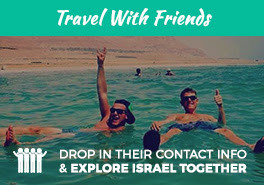 Connect to Israel in the way that is perfect for you on this once-in-a-lifetime journey! This trip only runs during the summer season. "What I loved about Shorashim was the amount of diversity on the trip. We had people from all different backgrounds of Judaism and we got to learn something from each of them."